Thursday marked 48 hours until The Cancer Research UK Boat Race 2018, and the four clubs and two umpires took turns to face the media throughout the morning. The Head coach, Cox and President from each crew came along, whilst Cambridge University Women also brought Myriam Goudet from the Blue Boat. The latter were first to face the press; Coach Rob Baker reported that the crew had been moving well and were looking forward to the challenge ahead. Cox Sophie Shapter, who went to school at Latymer and learned to cox on the Tideway, was asked about her experiences and how they would benefit her. She said “It’s been a real journey to this point and I’m excited to just get to the start and see what this crew can do”. She also spoke about her friendship with Oxford President Katherine Erickson; the two competed together for the Tideway Scullers School last summer. President Daphne Martschenko, who will compete in Blondie this year, spoke of her admiration for Rob’s program and also the different challenge presented by racing in the reserve crew. A veteran of two Boat Race campaigns, Myriam touched on the development of CUWBC from her first year to now, and also said that she had put last year’s race to the back of her mind to solely focus on the 2018 campaign. Hugo, who is also in his final year with the Light Blues, talked about how returning members of the squad had stepped up to take ownership of the crew and had led from the front. His extensive Tideway experience (he learned to cox at Westminster School) also lent him a great deal of knowledge. 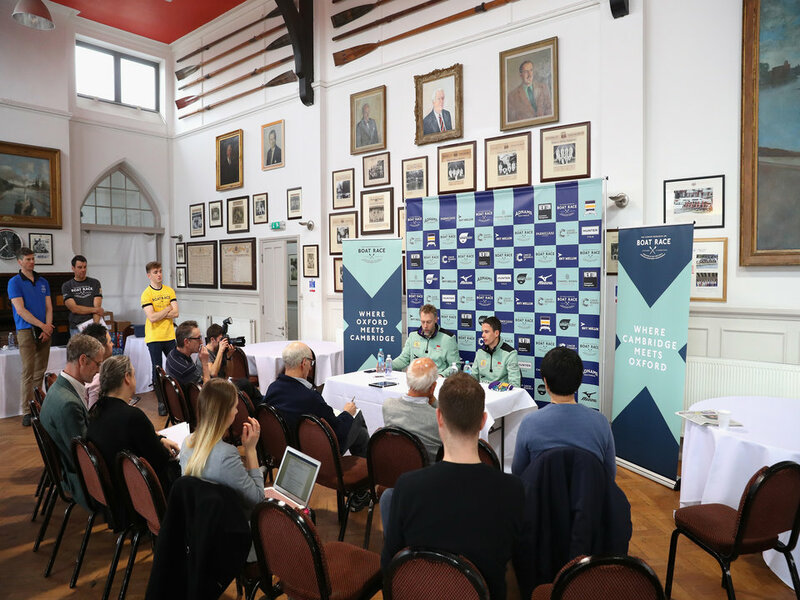 Oxford University Men’s Boat Club were last to face questions; Head Coach Sean Bowden, Cox Zachary Thomas Johnson and Presidet Iain Mandale came to the media centre to talk through the race. Naturally, the late substitution was a hot topic and Sean reiterated the fact that Josh left the crew through illness. He also stated that Benedict’s inclusion had had a positive effect on the boat’s speed and that they were enthused to race on Saturday. Iain also spoke about the fact that this was his first Boat Race. “It’s been really exciting seeing this all come together,” he said, having already won for the Oxford reserve crew on three occasions. “We’re keen to just get out there now and put into practice the work we’ve been building over the past few months”. Zach, who conducts orchestras in his spare time, is facing his first Boat Race but explained the formative nature of the past few months and how important it was to be calm under the intense pressure of The Boat Race. The Umpires were also called to face the press; John Garrett and Sir Matthew Pinsent (men’s and women’s respectively) came to talk about the race. The subject of false starts and getting to the start on time was raised, as both emphasised the importance of attaching to the start with plenty of time to spare. Beyond that, they discussed their hopes for a fair race without any outside interference; John’s exciting history as an umpire was brought up too. The 73rd Women’s Boat Race starts at 4:31pm and the 164th Men’s Boat Race begins at 5:32pm.